Firstly, take a good look at the top photo. The cross pieces both go under one middle spar and over the other one. 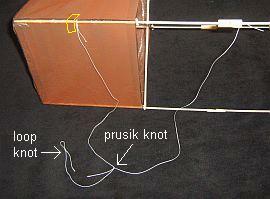 Hence the kite can be opened out into a box shape. Take a bamboo skewer, and snip it to a length just a little longer than one of the cross-pieces already in place. By trial and error, trim the bamboo down until you can just squeeze it into place next to an existing cross-piece, but diagonal to it. Just one more cross-piece to do. Fit the last cross-piece in place in the same way, at the other end of the kite. Make more marks so you know where this one goes too. When its length is just right, glue the small pieces on and wait for the glue to dry. The bottom photo is a close-up, with my markings visible on a main spar and one of the cross-pieces. The other cross-piece had single marks instead of double, to tell them apart. Hope you get the idea! Measure 0.3SL (8.7cm, 3 1/2") in from one end of a spar (half the width of the sail), and use a spare skewer to poke a small hole through the plastic, on either side of the spar. Cut off a 3.0SL (87cm, 34 1/2") length of flying line, and tie a small Loop Knot into one end. 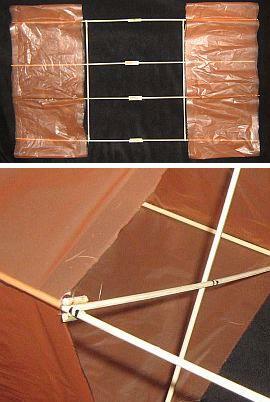 Attach the looped end to the kite, by passing it in one hole and out the other. Feed the other end of the line through the loop and pull tight around the bamboo. See the photo. Add a small length of clear sticky tape onto the sail plastic, to prevent the bridle shifting forward and stretching the plastic. The yellow rectangle on the photo shows where the tape is. Attach the other end of the line to the same spar, just behind the join of the 2 skewers, using a couple of Half Hitches. Smear a drop of wood glue all around the bamboo and into the knot, to hold it secure. Now take a length of flying line about 1.0SL (29cm, 11 1/2") long, and tie one end to the bridle line with a Prusik Knot, or any other shiftable knot. Tie a small Double Loop Knot into the other end. All this is visible in the above photo. At this point, you've pretty much finished making the MBK 2-Skewer Box Kite! Now, I had some trouble with the cross-pieces falling out while the kite flew in rough air. Hence you might like to glue the cross-pieces in place! The kite is a convenient size to put in the car, fully rigged, and won't take up much space in a shed.